Now 30% OFF in the Crochet Spot Store, the Classic Children Cardigan Sweater comes in 8 sizes ranging from US size 2 – 16 with bust measurements ranging from 21″ (53 cm) to 32 1/2″ (82.5 cm). Use this unisex pattern to crochet a sweater for your toddler to teen. The sweater is crocheted from the top down with no sewing required (other than sewing on the buttons), so that you can easily adjust the size if needed. This sweater is also available in baby and adult sizes. 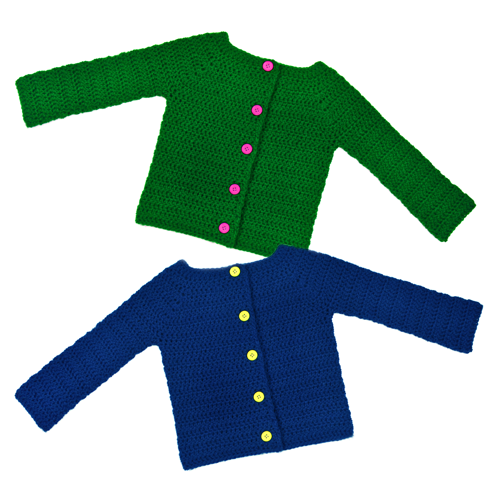 Feel free to check out the Clothing Section and the Baby Section for more sweater patterns. Pattern is already marked down. There is no need for coupon codes. Log in, then add the pattern to your cart and check out. All purchases can be downloaded directly from your account once completed. Offer ends April 26, 2018. This entry was posted on Thursday, April 19th, 2018 at 11:32 AM by Rachel Choi	and is filed under News. You can follow any responses to this entry through the RSS 2.0 feed. You can skip to the end and leave a response. Pinging is currently not allowed. What a handsome sweater! And thank you for the discount.